From Omolokum's delicious dishes in the Port Zone, to the "roda de samba" at Quilombo do Grotão, in Niterói, get ready to discover authentic African culture in Rio. RIO DE JANEIRO, BRAZIL – On July 9th, the Valongo Wharf, in Rio’s Port Zone, was declared a World Heritage site by UNESCO. Being the largest entry point for African slaves in the Americas, “Cais do Valongo” (its name in Portuguese) is a monument to Rio as an epicenter of the Afro Brazilian culture. Dida Bar and Restaurant offers an Afro Brazilian menu that goes way beyond the “feijoada”, photo internet recreation. With over 85 million self-declared black people, Brazil is the country with the highest number of Afro-descendants in the Americas. The African legacy lies in every aspect of Rio’s culture until the present day. The way Cariocas eat, dance, pray, celebrate, talk and dress is deeply influenced by the habits the transatlantic ancestors brought for over three hundred years. Mainly originating from Africa’s West Coast and the former Kingdom of Kongo (current Angola and Congo Brazzaville), Brazil’s former slaves played a definitive role in shaping the country’s culture, leaving a legacy that goes way beyond samba or feijoada. For those looking for a culinary experience that extends beyond the feijoada cliche, Omolokum and Dida Bar and Restaurant are two great bets. Aimed at gathering ethnic cuisine, music and arts, Omolukum is an eatery at Morro da Conceição, in Rio’s Port Zone, offering a mouth-watering variety of palm oil-based Afro Brazilian dishes. 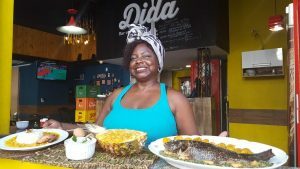 Located at Praça da Bandeira, in Tijuca’s region, Dida Bar and Restaurant offers a menu with typical Afro Brazilian ingredients and combinations that is definitely worth the try. The “Mufete”, with roast fish, vinaigrette sauce, palm oil beans, cassava, sweet potato and farofa, is one of Dida’s highlights. Old capoeira masters gather every Sunday to play at Roda Livre de Caxias, photo internet recreation. What’s more, one cannot miss Feira das Yabás, a multicultural event that takes place in Madureira every month’s second Sunday. Feira das Yabás (The Fair of the “Yabas”, term that designates the female orishas from the Afro Brazilian religion Candomble) is an all-day democratic event that gathers live African rythms, like samba and jongo, Afro handcrafts and Afro culinary. Mixing tourism, history and social activism, “Conectando Territórios” (Connecting Territories) is a project that takes Brazilians and foreigners to spend a day in a “quilombo”, the former refugee slaves’ communities. “The project aims to approach people to the Brazilian history through conscious awakening experiences connected to the Afro Brazilian roots”, says Thais Rosa, “Conectando Territórios’ founder. The next tour happens on August 27th at Quilombo do Grotão, in Niterói. The experience includes a talk with the quilombo’s residents, lunch, roda de samba, transportation and a guide. In Madureira, one of the most authentic roda de samba takes place at Serrinha, a favela situated in Madureira. On the last Sunday of every month, samba veterans gather at Casa do Jongo, in Serrinha, to play homage to the biggest composers from the genre’s history. “Serrinha’s samba reconnects me to my ancestry. It is a genuine roda de samba, with no amplifiers. It is the audience who sets the tone. This allows a more real experience, where people actually exchange emotions and energy. I feel reinvigorated when I go there,” described Cleiton Sobreira, a Carioca from Bento Ribeiro (a neighborhood next to Madureira). Founded in 1951, Afoxé Filhos de Gandhi is a cultural group that preserves the Afro Brazilian spirituality, music and dance. Every once in a while, it is possible to watch their performance in Rio’s Centro, where Filhos de Gandhi’s headquarters is located. Every February 2nd, the cultural group celebrates the Iemanja’s Day (the sea orisha in the candomble), when hundreds of people gather in Rio’s Centro to sing and dance some “ijexá”, one of the Afro Brazilian sacred rhythms, very common in Filhos de Gandhi’s festivities. Considered a game, a fight and a dance, capoeira is one of the most traditional expressions of the Afro Brazilian culture, practiced worldwide. Unknown destination for most foreigners and even tourists, Caxias, a municipality situated fifty minutes from Rio, hosts one of the most traditional “roda de capoeira” in Rio’s State. 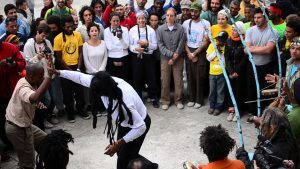 Roda Livre de Caxias (Caxias’ Free Circle) happens every Sunday at Praça do Pacificador, in Caxias’ downtown, gathering over ten great masters from both capoeira angola and regional (the two different capoeira modalities) for over forty years now.